Some friends got together to compare a bunch of phonostages. We gathered at my place and listened to a single LP track on my Balrog turntable and the Orions. One of the phono preamps was my first build of the AN1651 Curcio design. I recorded the output of each phonostage and did a little analysis. This page presents my findings. You can download the recordings at the end. 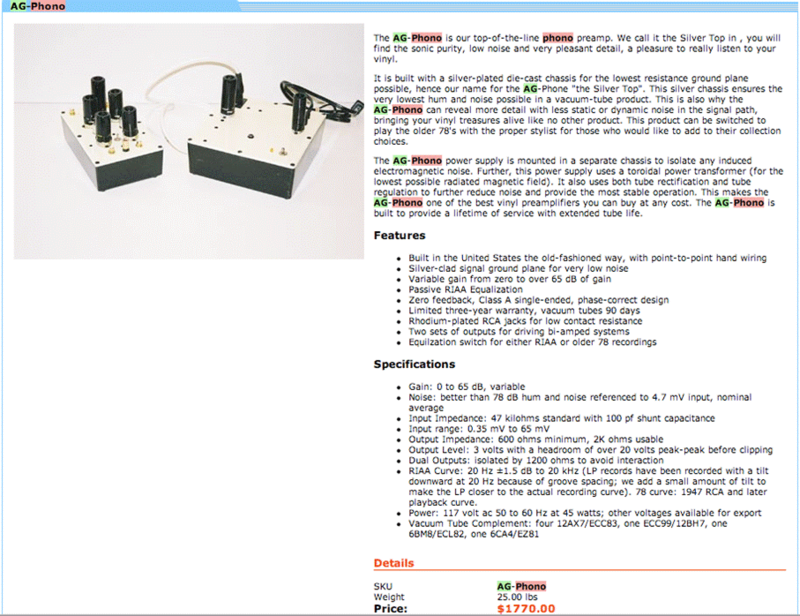 Some may question the ability of an ADC and a computer to capture the subtle differences between phono preamps. I don’t. We listened to “St James Infirmary” from the Classic Records reissue of “Satchmo Plays King Oliver”. We used five different phonostages and a contributed pair of silver interconnects between each phonostage and my passive preamp. The tracks were recorded to a laptop using an E-MU 0404 USB A/D and D/A converter at 24 bit 96kHz bitrate. I set the two channel recording levels to within 0.2dB of each other when playing a 1kHz test tone from a test LP via the Curcio phonostage. The recording level was not changed during subsequent recording. The output levels of two phonostages were hot enough to cause a little bit of digital clipping during recording. So there are nine different versions to evaluate. Most processing was done in Adobe Audition. All processing was done at 24/96 except the final conversion to 16/44 for CD playback. View each clip and declip/lower/reconstruct the waveform using the declip tool in Audition. 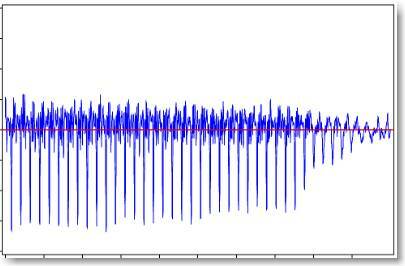 About 20 clipped waveform peaks were fixed on the Wavestream recording, and about 200 on the SuperIT. The hottest phonostage was the SuperIT, while the Ono + stepup combination had the lowest output level. There is a 10dB difference between the two. The Wavestream was 1dB lower than the SuperIT, while the rest are in the middle. I looked into the levels so I could adjust the files (amplify or attenuate) so they’d play back at the same loudness for valid comparison. Adjusting levels based on average or peak power figures derived by Audition didn’t do the trick so another approach was needed. Replaygain is a technique for calculating a level correction factor that is applied to produce equal loudness playback. For any sound file, it comes up with a correction (in dB) that can be used to make different songs have the same perceived loudness of 89dB. I find it to be extremely good when comparing different versions or pressings. Google it for more info. Most differences will disappear when recordings are precisely level matched. Without level matching, the loudest recording invariably sounds the best. Many instruments have asymmetric waveforms. This information from http://www.audiomisc.co.uk/asymmetry/asym.html shows how trumpest and French horns have waveforms with higher amplitude negative peaks than positive peaks. On our recordings, I found that the phase of the Curcio was the opposite of all the other preamps on trumpet notes. I could not find any waveforms for trombones. Either trombones behave differently than other brass, or the recording itself has the phase reversed from one instrument/microphone to the next. The next waveforms show a single long trombone note (down) followed by three trumpet notes at the yellow line (up). The Classic pressing on the Curcio has the same phase as the CD, as did the Oracle/Benz/Blue Circle Classic rip found on the web. All the other phonostages were the opposite, as was my original pressing on the Curcio. In any case, the Curcio does not invert phase. Many older source components invert phase under the assumption that the following preamp will be a single stage device that (normally) will invert phase as well, leaving the signal phase correct from source to amps. The files are 16 bit 44.1kHz wav files so they can be burned to CD for playback if you like. The file names have been carefully obscured if you would like to do blind comparisons. If using a Windows PC, you can restore the original names by running (double-clicking) the script “shownames.bat”. You can hide them again by running “hidenames.bat”. So how do the different phonostages sound? You tell me–that’s what the comment section is for.